The Elder Scrolls V: Skyrim is a fantastic game right out of the box, but the reason so many people still play it so many years after its initial release is the massive modding community. Skyrim mods can do almost anything, from drastically improving the graphics, to creating new quests and non-player characters (NPCs), to something as simple as making the maps more attractive. Modding Skyrim and Skyrim: Special Edition isn't too difficult, but it can be a somewhat confusing process. 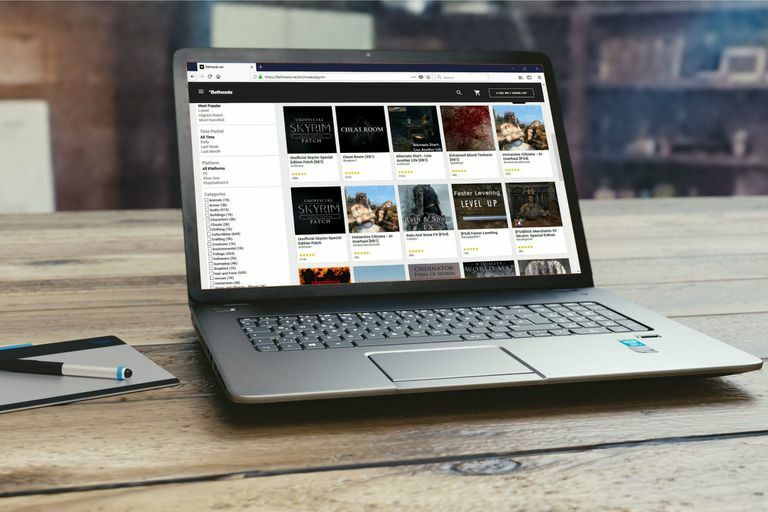 Since there are two different versions of the game, and Skyrim is available on so many platforms, there are multiple different ways to find and install Skyrim mods. What Version of Skyrim Do You Have? There are two versions of Skyrim, and the game is also available on a number of different platforms. Both versions can be modded, but the only platforms that are compatible with mods are PS4, Xbox One, Windows PC, and Steam. The version of the game, and the platform you are using, will affect the process you need to go through if you want to mod your game. Mods are not compatible with the PS3, Xbox 360, or Nintendo Switch versions of Skyrim. Skyrim: Special Edition is a version of Skyrim that is available for PC and consoles, and it is designed to make the modding process very easy. In fact, Bethesda actually hosts a huge variety of mods on their own site, and you don't need to download any additional software to use them. Create an account, and log in. Navigate to the Bethesda.net Skyrim mods page. Click on any mod that you want to install. Once you have found some Skyrim: Special Edition mods that you want to install, the rest of the process takes place in the game. You will need to tie your accounts together, choose some of the mods you found, and install them. Launch Skyrim: Special Edition on your Xbox One, PlayStation 4, or Steam. Enter the email address you used when you created your Bethesda.net account, and select Create Account or press Enter. You need to select Create Account even though you already have an account. As long as you enter the same email you used to set up your Bethesda.net account, you will then get the option to log in. Enter your Bethesda.net username and password, and select Accept or hit Enter. Select a mod that you want to install. Select Download, and wait for the mod to download. Select Back or press Escape to return to the main mods screen. Repeat steps 5-7 for any additional mods. Select Back or press Escape, and the mods will load. Some mods do not work well with other mods. If your game does not operate normally, try adjusting the load order by selecting Load Order from the main mods screen. If that doesn't work, you may need to disable one or more mods by clicking on the mod and then clicking on Disable. Depending on your platform, there may be limits on how many mods you can download and install. The number of mods you can install will also be lower if you don't have enough free space on your console. PS4: No more than 100 or 1GB worth of active mods. XBox One: No more than 150 or 5GB of active mods. Steam: No hard limit imposed by Steam. Skyrim itself has a hard coded limit of 255 mods. The space limitations are placed by Microsoft and Sony, while the limit on the number of mods you can install can be placed by either the console manufacturer or Bethesda. The limitation on the number of mods can change from time to time if Bethesda decides that Skyrim is capable of handling more, or less, mods while still remaining stable. Before you can use Nexus Mod Manager, you need to create an account on the Nexus Mods site. Account creation is free, although there are limits placed on free accounts. For instance, download speed is capped if you don't pay for a premium account. All of the Skyrim mods on the Nexus Mods site are free, and you are not required to pay any money or provide any billing information during the registration process. Navigate to nexusmods.com and create an account. You do not need to pay to create an account. If you do not wish to pay, do not select any of the payment options during the registration process. Download the Nexus Mod Manager. Install and run the Nexus Mod Manager. Wait for Nexus Mod Manager to locate your copy of Skyrim. Nexus Mod Manager searches for over a dozen different games. Once it has located Skyrim, you can click Stop Searching if you don't have the other games. Click the green check mark to confirm the location of your copy of Skyrim. If Nexus Mod Manager locates multiple games, you must click each green check mark to proceed. Select Skyrim or Skyrim: Special Edition, and click OK. Select the location where you would like to store the mods that you download, and click Finish. If another window pops up, click OK.
Change the location where mods are stored, or just click Finish. After you install Nexus Mod Manager, you need to dig in and find some mods for it to manage. This is done through the same Nexus Mod site where you made an account and downloaded the manager software. Locate a mod that you are interested in, and click on it. Click on Download with Manager. Wait for the mod to download in Nexus Mod Manager. You may need to authorize Nexus Mod Manager to make changes to your system. If it fails, try running Nexus Mod Manager as an administrator. In the Nexus Mod Manager client, select a mod that you have downloaded, and click the green check mark on the left to install. Wait for the mod to install. Repeat steps 2-7 to install any other mods you would like to use. You can download and install as many mods as you want with Nexus Mod Manager. In fact, it's literally possible to run hundreds of Skyrim mods at the same time. However, adding too many mods can slow the game down, and some mods don't work well with each other. If you find that your game doesn't run well, or that it doesn't launch at all, use Nexus Mod Manager to change the load order of your mods. In some cases, changing the load order will make them work well together or run more optimally. If that doesn't work, then the next step is to use Nexus Mod Manager to disable mods until your game starts working again. Steam is a service that allows you to purchase games, download mods, and play online with your friends. If you own either Skyrim or Skyrim: Special Edition on Steam, then the absolute easiest way to install mods is to go right through Steam's own workshop. Owners of the Steam versions of Skyrim can use mods from both Nexus Mods and Steam Workshop, and owners of the Steam version of Skyrim: Special Edition can use mods from Nexus Mods, Bethesda.net, and Steam Workshop. Using mods from multiple sources works fine in some cases, but you may experience undesired effects. Launch your Steam client and log into your account. Locate The Elder Scrolls: Skyrim or The Elder Scrolls: Special Edition in the games list on the left side of the client and click the one you wish to mod. Click Community Hub in the Links section on the right side of the client. Click Subscribe to install the mod. You may need to close Skyrim and launch it again to successfully install your mods. Some Steam Workshop mods and mods from other sources may not work well together.